A short post today because the photo says it all. Life was simpler back in the early 1960s. Everything connected with Christmas is on top of, alongside, or in front of the radiogram. There should be a tin of Quality Street and/or Roses confectionery somewhere -- I wonder if the biblical birth scene is on top of the chocs; there's definitely a box beneath the log cabin. I can't see the little wooden box of EatMe dates, dates being the one concession to the actual birth place of the baby Jesus. I think those are little bottles of orange juice but if so, where's the gin? Orange juice is of no use without gin. This was before the days of wine-drinking, at least in our house. 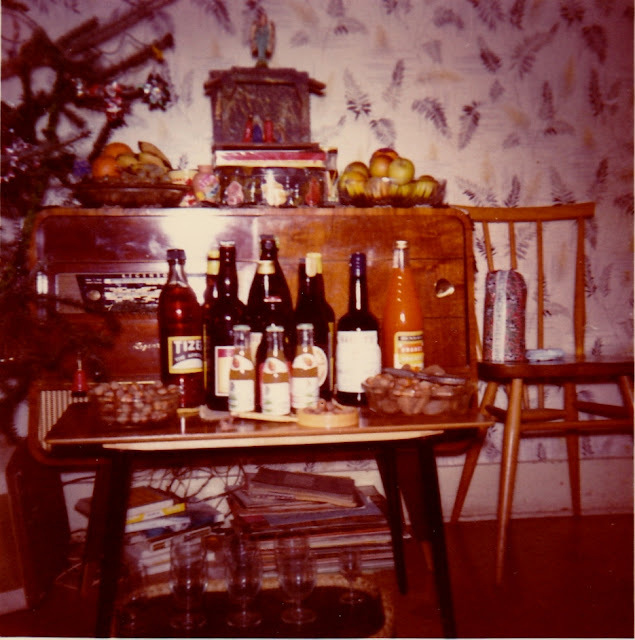 We always had Dubonnet and Schweppes bitter lemon to offer guests but it seems to be MIA -- maybe Christmas Eve was a bit jollier after the children went to bed, or maybe Santa was less of a milk and cookies man than we thought! I believe that's a bottle of Scotch whisky lurking behind the cheap sherry -- that would be for Dad. The unopened Bristol Cream Sherry would be for Mum. There's "Tizer" for my brother and sister and me. That would be our Christmas dinner treat. I suppose the gifts are out of sight under the tree. Surely that one wrapped parcel on the chair can't be the only gift! It's quite possible that the Cratchits had more for their Christmas Day celebrations than this but "Be it ever so humble," this little corner of our household brought more joy than you can possibly imagine.